A ganglion is a pseudo-encapsulated cystic structure that is filled with thick, viscous, mucinous material and may arise from any synovial lined structure i.e. 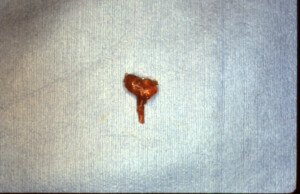 tendon sheath or joint and may present anywhere this type of tissue is present. It is the most common mass of the hand. The most common locations are the dorsal wrist, volar wrist and tendon sheath at the proximal digital flexion crease. No treatment is necessary unless there are associated symptoms. Aspiration may be attempted but the recurrence rate is high. Most hand surgeons do not recommend aspiration of volar wrist ganglions because of the risk of injury to the intimately adherent radial artery. 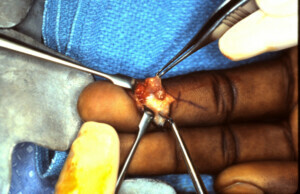 Definitive treatment is surgical removal with a portion of the involved structure to reduce recurrence rates. An unusual location for a ganglion was identified at the distal inter-phalangeal joint and was thought to be a retinacular cyst or a cyst of the tendon sheath but upon further exploration it was found to have its origin from the joint under the flexor tendon. Specimen removed with long neck seen was traced to its’ origin and removed completely.